​Is your website or blog mobile-friendly? ​ It is now absolutely essential to have a mobile-friendly website or blog if you intend people to access it without difficulty. 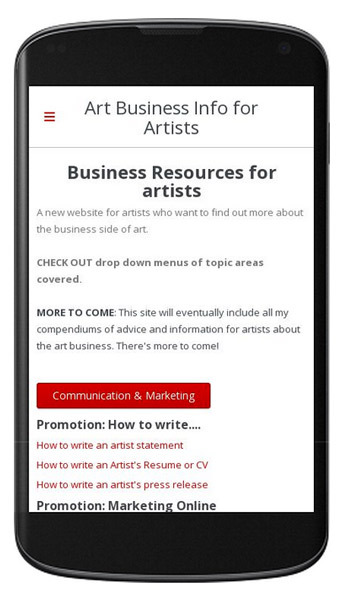 More than 50% of browsing for art takes place on mobile devices. Google has decided to rank sites by how mobile-friendly they are. The two main search engines both have a tool to test out whether or not a website or blog is mobile friendly. I recommend you use both as I find they give slightly different results. Is it easy to navigate using a mobile device? Can you find the main menu easily? Are the options all available or is the list truncated? Can you read the text easily? Is the font size appropriate? Is there a good contrast between the colour of the font and the background? or is all scrolling limited to vertical (i.e. OK)? Does the content resize to the size of the viewable screen? Is your website using a responsive template? Does it load quickly using mobile broadband? For example is it read easily by iPads and iPhones (which do NOT use Flash) as well as tablets and Android smart phones? Can browsers and search engines crawl and read all the code on the page? Do URLs and html stay the same? Does it pass the Google Mobile-Friendly Test? Google recommends that you Optimize your entire site for mobile devices. Google now ranks websites accessed via mobile devices by whether or not the website has been optimised for a mobile experience. If you've not updated your website will not rank well for mobile devices. Mobile devices are now the technology of choice for many people browsing websites. lots of people have switched to mobile devices for browsing (and the numbers are increasing exponentially every quarter). Hence you need to deliver a good experience on every type of mobile device both tablets and smartphones. Over 50% of traffic to retail sites now comes from mobile devices. Failure to rework a website so that it is compatible with mobile devices can mean that traffic reduces over time. If your site is NOT mobile friendly it will be difficult if not impossible to read easily on a mobile device. Multi-Device Layouts. I recommend studying this. In my blog post Companies who can resize your website for different screen sizes I detail a list of companies that Google is highlighting as approved multi-screen vendors.